Living in a van can be a beautiful freeing exploration of the self, giving you the freedom to live and travel when, and where, you want. But it can also be very challenging as you interact with different parts of yourself, your beliefs, your systems and your rituals as you hold under a microscope many different elements in your life. It has taught me the importance of developing my daily rituals and so over the next few weeks I’m going to share with you some different ways I’ve found to maintain order and move towards positivity and success in my week, especially when chaos reigns! And of course you’ll be able to use them whether you live in a van or not! Imagine you wake up on holiday everyday. Sounds great right? Well not so fast! When nothing is regular it is enjoyable to just float mindlessly on a mental holiday but when you are trying to live, work and run a business every day the over stimulation and lack of regularity can be disastrous! Your life can feel like you are riding a small yacht in a big storm, with your sailor skills being tested in every way! You have very little that is familiar to keep you regular and habitual. Being that I would have an irregular work and therefore sleeping schedule (AND my sleeping location often differed each night) my daily cycle would often be vastly different each day too. To some extent you can plan for it with your calendar however sometimes you have to allow yourself to re-set your goals and plan for the day ON THE DAY, based on changes in location and your energy. As they say, those who fail to plan, plan to fail. Spending time in lots of different communities for work, training and study, and the travel, meant that I was often on different wavelengths with my energy and emotions. What I needed was the space to just stop, reset and start my day with a brand new slate each time. Something meditative yet direction filled. A clear launch pad for my day and the coordinates to fire myself at based on the target for the day. It seemed that I actually missed them. So I brought them back into my morning routine somewhere between “bathroom” and “breakfast”. I get my diary out and sit for five to ten minutes to answer the questions. I don’t do the same ones all the time as I do like to change things up but some stick around and are amazing to use everyday! – What am I grateful for right now? – What/who makes me happy? – Who do I love? – How will I love my body and mind today? – What things have been distracting me/on my mind lately? – What is important to me right now? – What things must I do today to be/feel successful/happy/complete? – What new things am I going to learn today? – Who needs my help today? – Who am I going to serve today? – If all except five of my friends/loved ones left me, who would I wish to stay the most? – What is it that I am going to do today to become more in alignment with my needs, desires and values in life? – How different am I compared to one year ago? – In one year, what one difference would I most like to see occur? – What am I going to laugh at today? – Who am I going to laugh with today? – If I were to throw out all of my possessions, except for only five things I had room for, and move into a van, what would I keep? – What is one person or memory I would like to experience again but know I never can? – What is my superpower? What gift do I bring to the world? – Why is that tough challenge, that has been stopping me for so long, going to feel so amazing when it is complete? – Who can I call who knows more about “Big Problem X” than I do? – What would I do today if all the power / WiFi went out? There are a lot of questions here so if you’re not sure which ones to pick from above, start with the top ones and then choose three random ones from the second list to add to do that day. To ensure they get done, set an alarm in your phone or write the questions on a piece of paper and leave them next to your breakfast for you to remind yourself at the right time each day. – They presuppose there Is an answer which gets you set with positive and action oriented states and behaviors for the day ahead. – They make you search. They make you work and force you to get clarity on what is going on. – They get you to sort the wheat from the chaff. They make you find the good, worthy and important stuff. Try it for one week. Does it work? If not, why not? How can you make it your own? To help name and claim your results, whether good or bad, share them with someone. Email me with the results! I’d love to hear! 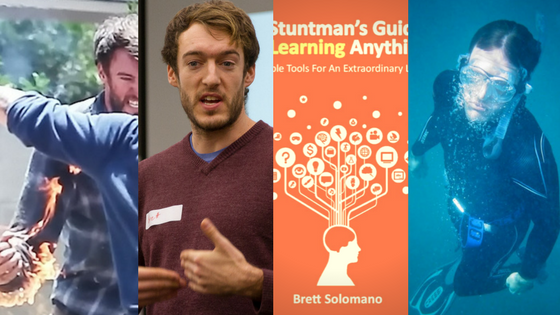 Don’t forget to like my page and add yourself to my mailing list (and get two free chapters of my book “A Stuntman’s Guide to Learning Anything” and also to find out when part two in this series is published!